I knew that after I reached my weight loss goal that I would still have challenges and have definitely found that to be true. It seems like my body wants to go back to the “old” me? How do I know? Even with tracking everything I eat and exercising, I’ve gained 5 pounds. It’s depressing. But it’s not unexpected. So how am I handling it? 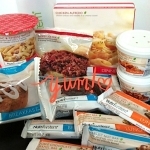 I’m using calorie and portion-controlled Nutrisystem foods to stay on track. And tomorrow, I plan to call Nutrisystem and have one of the dietitians help me figure out once and for all, how many calories I really *should* be eating. Up to this point, I’ve been guessing around 1700 (to compensate for exercise), but clearly, that’s not right. I really should have taken advantage of this support with Nutrisystem before, but I stubbornly thought I could do it on my own. Wrong! I’m not beating myself up over the weight gain–it happens. And I feel like I still have the right mindset to maintain my healthy lifestyle. If you’d like to lose weight and get healthier on Nutrisystem, or for more information, go to www.nutrisystem.com and take advantage of the summer savings! How are you doing facing with the challenges that you’ve encountered on your weight loss plan? Let me know in the comments! Disclosure: As part of the Nutrisystem Nation Blogger Program, Nutrisystem has provided me with complementary meals in exchange for my honest thoughts on the Nutrisystem plan. The opinions expressed in my posts are entirely my own. No other compensation was received. Nutrisystem Update: Stay motivated and believe in yourself! One year later: Nutrisystem Weight Loss Goal Maintained!